Saudi Arabia and 10 of its Middle East allies began their military offensive in Yemen with over 100 warplanes and 150,000 troops. Saudi-led warplanes killed at least 82 people when they struck mourners at a hall in the Yemeni capital Sanaa on Saturday, the acting health minister in the Houthi-run administration said, but the coalition denied any role in the incident. Ghazi Ismail also said that 534 other people were wounded in the air strike in the southern part of the city, where a wake was taking place for the father of the administration’s interior minister, Jalal al-Roweishan, who had died of natural causes on Friday. The death toll was one of the largest in any single incident since the Saudi-led alliance began military operations to try to restore President Abd-Rabbu Mansour Hadi to power following his ousting by the Iran-aligned Houthis in March 2015. Among the victims were military and security officials from the rebel group fighting the government of Saudi-backed President Mansour Hadi, who is currently in exile in Riyadh. The coalition has been conducting deadly airstrikes that have constantly targeted civilians, United Nations recently said that nearly 10,000 people have been killed in the 18-month-long armed conflict in Yemen, among them 3,799 civilians including women and children. The Houthis, whose name means “Supporters of God,” follow a similar ideology to Lebanon’s resistance movement Hezbollah and played a prominent role during the ousting of dictator Ali Abdullah Saleh in 2011. 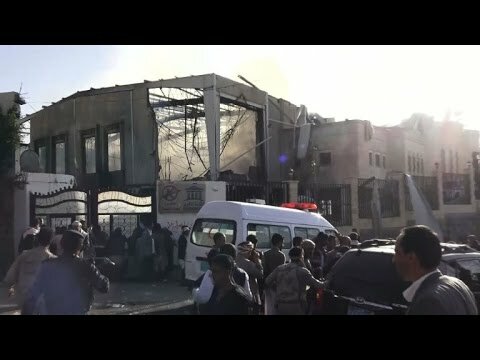 Saudi Arabia has constantly targeted civilians and public facilities like hospitals, including those run by international organizations like Doctors Without Borders.